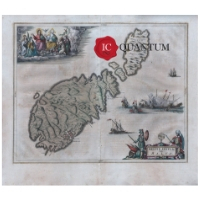 ICQUANTUM specialises in fine, rare and original antiquarian maps, old maps and charts, views, engravings and books related to Malta by the most influential cartographers. Visit the online shop to see the extensive range of exclusive Melitenisa collection if you are in search for a personal, business or corporate gift and an investement. 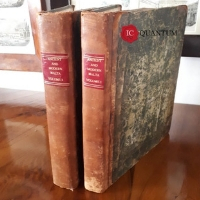 In our antique Malta books section, you will find rare books from the 17th, 18th and 19th century. All books have either maps, views, illustrations or all, apart from the interesting text and history recounting the actual happenings, journies or even battles from the period. The books are found in most languages, being, English, French, Italian, Latin, German, Dutch, and others. Some books are first editions or second. I try the best to acquire the best condition of books taking into consideration the age and provenance. A definate must for the keen collector. 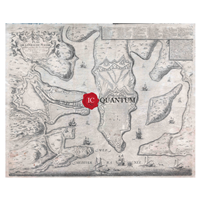 The map of Malta from the Melitensia period is one of the most sought after by map collectors, be it for its history, details and popularity. 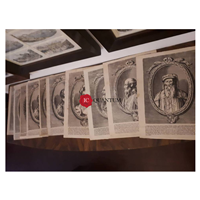 The collection ranges from the most famous in the 16th century by Munster, along with the elaborate Anton Francesco Lucini siege maps, complimented with French, Italian, Dutch and other cartographers and engravers. Different sized maps from 10 cms by 10 cms up to a meter wide can be found in my collection, black and white or coloured, like the famous most elaborated map by Homann and Coronelli and many others. 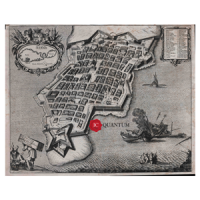 The variety of Valletta engravings can be documented as a plan or birds eye view. The first was issued directly from the book by Bosio 1602 and several derivates have surfaced from that date onwards as can been seen in this section. The early plan from 16th century maps by Perez d’Aleccio has been copied by Anton Franceso Lucini during the 17th century as described and followed by many others variying is size and proportions. The Malta harbour is one of the most important features of the island. Its prominent details and infrastructure enable shelter and easy access for merchants. 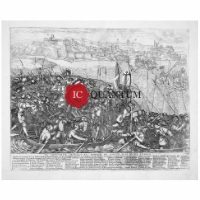 As equally described as the Valletta section, books elaborated as early as 1572 Braun and Hogenberg first engraved view of the harbour . Italian and French followed and enlarged plans for more detail. Plans of the harbour were not the less fetched in books or loose sheets as seen well in the 1688 Coronelli engraving. 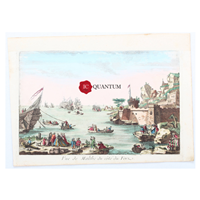 One of the most important sections and extensive illustrations are the views of Malta. Business flourished and the ports brought attention to painters, voyagers and historians. All was documented and costumes, soldiers, ordinary villagers, palaces, historical sites, village views, and other topics were all put down on paper as early as the 16th century till the British period. The streets of Valletta, village landscapes found themselves in all types of books and other printed material. In 1798 a little great man visited Malta leaving an impact with some illustrations and engravings. 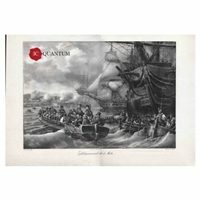 The most popular are Napolean’s disembarkation engravings. Some are not easy to find but interesting views can be found in this collection. 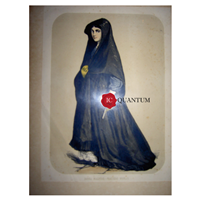 This is a separate section as clients prefer to purchase just Maltese costumes which appear here in copper engravings and lithographs . As occasionally seen today in some live villages, Maltese costumes are still worn for that antique feel and the printed engravings are a testimony. The most important event and elaborated books all talk about the arrival of the Grandmasters on the Island. This is documented with the extensive portraits found both in books and loose sheets. The most popular are found in the book by Vertot 1726 and eventually printers saw the demand and started to copy most of them and printed their own in French, Italian and English versions.